Itineraries are the detailed spots of travel or description of the places to travel and accounts of journeys. Wedding Itinerary is the planned and organized places of a wedding proposal template event usually prepared by both married couples; it starts from the wedding church up to the wedding reception and may include the destinations for the honeymoon of the couple. Perfectly suitable for the weddings which are destination based, this destination wedding itinerary is the best thing that a young couple could encounter. Made interestingly, the destination wedding itinerary template uses colours, flower motifs and the things you would want to see in a wedding itinerary template. This template can easily be downloaded and utilized. And the best part about the template is that it is free. 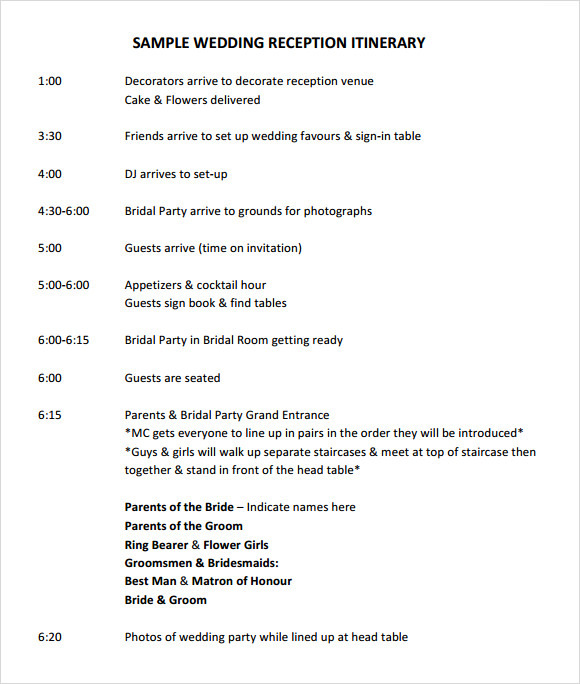 Wedding reception itinerary template is a custom template for the wedding receptions. It is also a nicely described document in which the exact itinerary is explained. 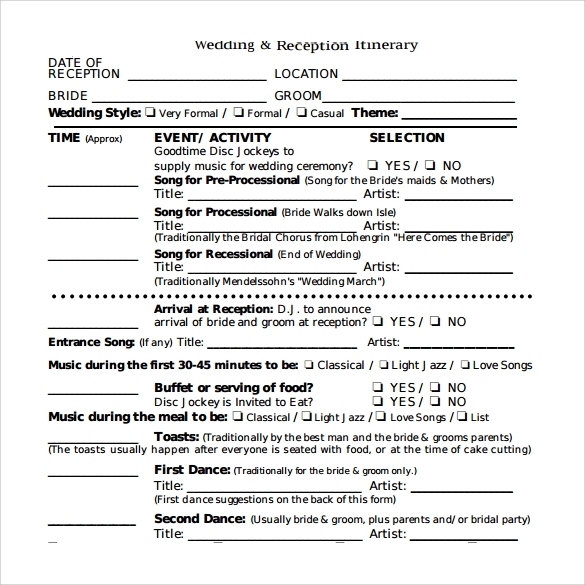 From the time DJ is set to the time of guests’ arrival, this particular template is quite a deal for punctual people. One can download it online for free. And the template is available in formats like PDF, Word, etc. 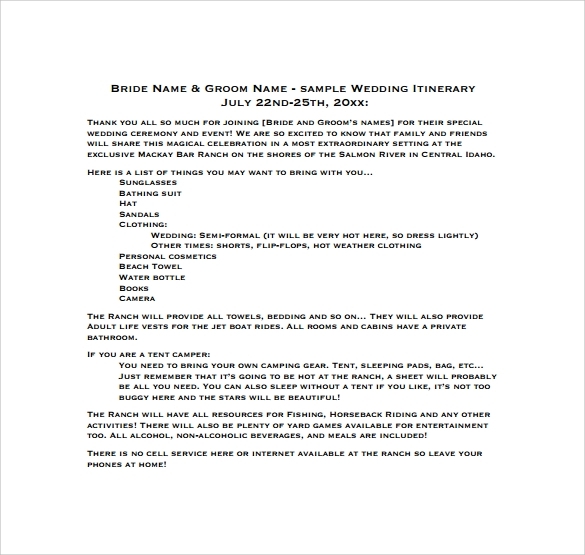 Sample wedding reception itinerary template as the name suggests is a sample itinerary document that can be used as it is. All you have to do is download it from online link for free in your choice of format and print it as well. Then you can fill up the necessary details according to you like the time, place, etc. 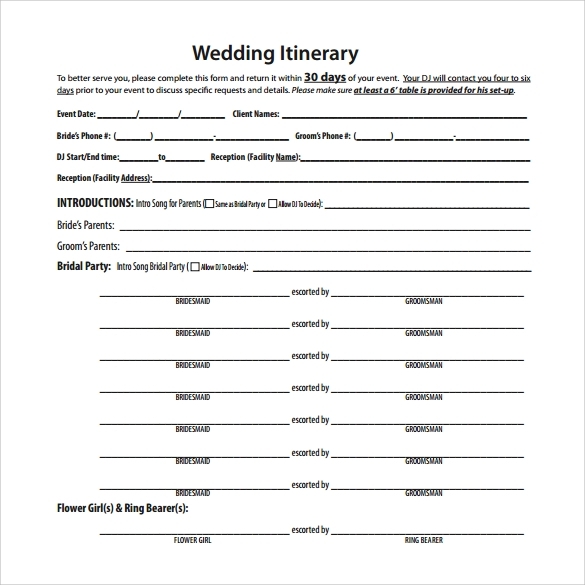 Wedding weekend itinerary template is a descriptive plan outlay for the weekend before the wedding on which all the important pre wedding festivities are arranged. This template is beautifully made and interestingly describes the itinerary. You can download this template for free in a format of your choice like PDF, Word, etc. 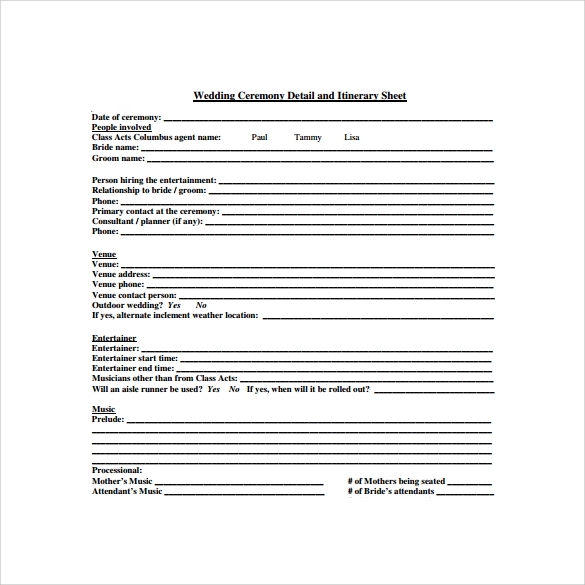 Why do you need a Wedding Itinerary Template? 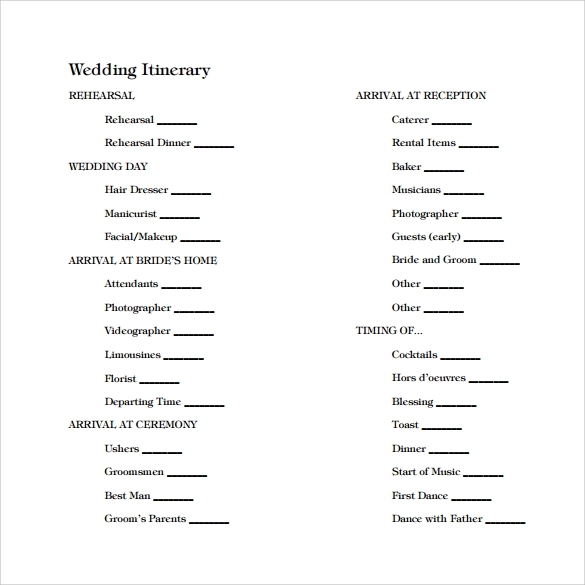 When do You Need a Wedding Itinerary Template? Wedding is a hectic affair, it demands calm mind so that you can think of creative ideas. You need to make a plan of all the things that has to happen like the pre wedding party, the cocktail party, bachelors’ night, the church schedule, etc. So for that a wedding itinerary template is quite useful. It’s your ready to refer document which you can reuse as well according to your own needs. Choose amongst the many itinerary templates to pick the best one for you. Wedding time is the most beautiful phase of life with which young couples don’t want to compromise. These sample ideas of wedding itinerary are the perfect option for them who don’t want to take any risk with their wedding. 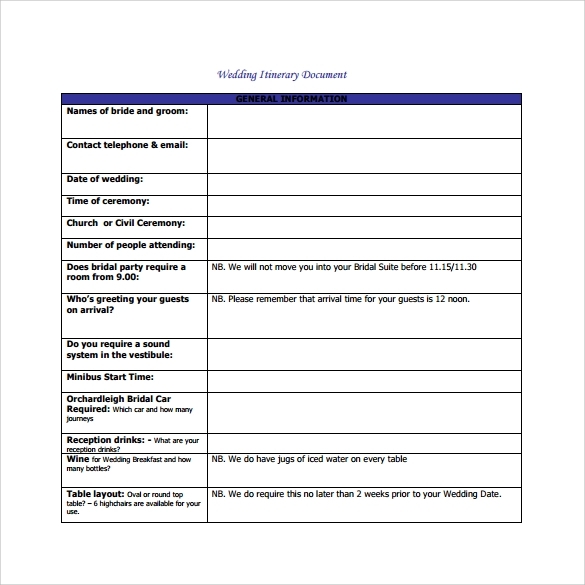 Use these ready to refer templates for a last minute solution. Wedding itinerary templates are a well designed collection of wedding itineraries which are beautifully made. These templates are full of ideas, designs and formats that the to-be-wedded couple can use for creating a perfect wedding itinerary for themselves.